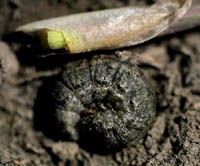 Black cutworm larvae vary in color from light gray to black and are about 1 ½ inches long when fully grown. Numerous convex skin granules give the larvae an overall shiny and "greasy" appearance. Tubercles on the body are paired, but uneven in size. Pupae are brown, spindle-shaped, and about ¾ inch long. The adults are nocturnal moths with a robust body and wingspan of about 1 ½ inches. The moths are dark gray, with a black, dagger-shaped marking toward the outer edge of the forewing. The inner two-thirds of the forewing is dark. The females lay ribbed, globular, white eggs in clusters of 10 to 30 near larval food sources. The black cutworm does not generally overwinter in Illinois, except possibly for pupae or mature larvae in southern areas. The bulk of the spring population, migrates into Illinois from southern states beginning as early as March. These moths are generally blown into Illinois on southwesterly winds and storm fronts that are common in early spring. Moth flights are generally heaviest in April and May. Females deposit eggs singly or in groups in areas such as low spots in fields, overflow ground, and in other sites traditionally overgrown with grasses or winter annual weeds. Weeds that are attractive to egg-laying moths include chickweed, shepherd's purse, peppergrass, and mustards such as yellow rocket. Winter wheat is also a likely host. Moths rarely deposit eggs on living soybean or corn plants. The entire development from egg to adult requires more than 45 days. Larvae hatch in 5 to 10 days after eggs are laid. Cutworm larvae pass through six instars and require 28 to 35 days, depending on temperature, to become mature larvae. The larvae enter the pupal stage, which lasts 12 to 15 days. Adults emerge, mate, and lay eggs on surrounding vegetation. This cycle continues until the first frost, and three or four generations are produced each year. However, only the first generation causes damage to corn. In late August through October, moths fly south to southern coastal region in response to changing environmental conditions. Factors that favor black cutworm outbreaks are late tillage and planting, reduced tillage, infestations or weeds prior to planting, low spots in a field, fields next to permanent vegetation, and excess crop residue (such as in no-till fields). Outbreaks also are more likely to occur in corn planted after soybeans than corn after corn. The most important of these factors may be late planting and pre-plant weed infestations. Fields that are planted late are likely to develop pre-plant weed infestations, which serve as ideal locations for egg-laying. In addition, late planted corn, or corn that is delayed in its development by unfavorable weather, can be attacked by cutworms before the plants emerge from the soil. Damage is likely to occur when weed hosts are destroyed and larvae begin feeding on corn. Small larvae feed on plant leaves. 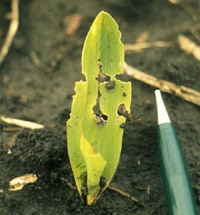 Early cutworm feeding can be identified as small irregular holes in the leaves of corn plants. The larvae feed above ground for about the first quarter of their lives, or until they are approximately half an inch long. 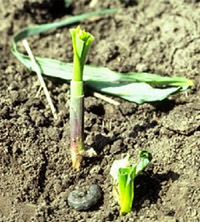 Cutworms do not begin to cut plants until they reach the 4th instar. One cutworm will cut an average of three to four corn plants during its lifetime. The larvae move rapidly up the row as they feed, so a large section of the field may quickly be destroyed. The cutworms usually cut the plant during the night and remain hidden during the day, when they feed on the plant in their burrow. However, they tend not to move on the soil surface when the ground is dry or crusted. They will be found in soil moist enough to permit them to burrow. When the ground is dry, this can easily be 3 or more inches below the surface. Corn is most susceptible to black cutworm damage when it is less than 15 inches in height, although plants as tall as shoulder height are sometimes attacked. A cutworm will often sever a small plant just below the soil surface and pull it under a dirt clod or into a small hole to feed on. A cut plant may look like it is stuck into the ground at an odd angle, and it usually will discolor as it begins to wilt. The black cutworm may not completely sever a large plant, it can kill the plant by tunneling into the base of the stalk and destroying the growing point. The growing point moves above ground as the plant grows. A the six-leaf stage, the growing point is at or slightly above the soil surface (a stage that occurs approximately 3 weeks after emergence from the soil). The plant's growth stage at the time of attack is important with respect to its ability to survive cutworm injury. A plant cut below the growing point will not recover. A plant injured above the growing point will sometimes regrow, but it is difficult to predict precisely how this injury affects the plant's yield potential. When scouting for black cutworms, plan to scout all fields at least once a week for a 3- to 4- week period following corn emergence. Pay particular attention to fields that were planted late or had an early season weed infestation. Check fields for leaf-feeding, cutting, wilting, and missing plants. Examine a minimum of 250 plants (50 plants in each of five locations) in a field. When injured plants are found, dig around bases of plants for live cutworms. Sometimes larvae will be found beneath clods, in the planter furrow, or in soil cracks. Determine the larval stages by using the head capsule gauge. Note leaf feeding caused by cutworms that are too small (1st to 3rd instars) to cut plants. Check these fields again in 24 to 48 hours. Record the number and size of larvae found per 100 plants, the percentage of injured plants, and the plant stage (the average number of leaves with collars visible per corn plant). Fields most at risk to economic injury are in the 1- to 4- leaf stage of plant development. Degree days can be an effective tool to help determine when to start scouting for black cutworm larvae. Degree-days can be used to predict larval development and when the first cutting of plants may begin. Pheromone traps are used to monitor moths flights in the area. The cumulative catch of nine or more moths over a 2-day period is the biofix for the black cutworm. The accumulation of degree-days begins when the biofix is reached. Currently, three options are available for cutworm control: pre-plant or planting-time applications of soil insecticides to prevent damage, and rescue treatments after the infestation appears. All of these options have limitations. Because of the uncertainty in predicting which fields will have light, moderate, or heavy infestations of cutworms, it is recommended to use rescue treatments for cutworms rather than to use a pre-plant or planting-time treatment. Moreover, because relatively few major cutworm outbreaks have occurred in Illinois in the past 10 years, a grower also may find an economic advantage to the wait-and-see system, which involves field scouting rather than a costly pre-plant rescue treatments are the amount of surface moisture and the movement of the cutworms. Control may be poor, regardless of the insecticide used, if the topsoil is dry and crusted and the cutworms are active below the soil surface. Cutworm control under hot, dry soil conditions may be improved by cultivating or running a rotary hoe over the field soon after spraying. This disruption may cause the cutworms to move and to come into contact with the insecticide. Illinois Insect Monitoring Network, University of Illinois. Cutworms and other corn caterpillars, Iowa State University. Black Cutworm Monitoring and Forecasting Program, University of Missouri.